While gopher was busy burrowing below ground, he discovered something unbelievable! Click here to play! It's a gold mine full of gold and now he needs your help collecting his fortune. Help Gopher fill his carts with that invaluable treasure and you'll be handsomely rewarded. Gopher is your ultimate helper in this underground adventure. He only appears on reel 2, but he will substitute for all other symbols to help you create more wins. You'll need a few supplies if you want to venture into the mineshaft. Spin two to three mine helmets and you'll get up to 5000 times your line bet. Three pick axes will bring in up to 250 times your line bet. And of course, the purpose of the mission: the gold and gems. Spin one to three rubies and you'll get up to 10 times your line bet. Three red carts will get you 100 times your line bet. Green will bring in up to 30 times your line bet, and blue will grab 25 times. There are also a few fruity treats that will bring in more wins. 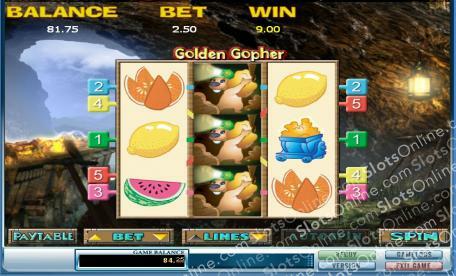 Help gopher dig out his golden fortune in this exciting five line, 3 reel game and you walk away with a small fortune of your own! The gopher acts as a substitute. He only appears on reel 2, but he will substitute for all other symbols to help you create more winning combinations.